The 17th of March 2016 will be long remembered in the Internet history books of Madagascar as the “Journée de l’Internet” or “Internet Day”. On this “Journée de l’Internet”, the local Internet community consisting of the Ministry of Posts, Telecommunications and New Technologies (MPTNT), Autorité de Régulation des Technologies de Communication (ARTEC), .MG ccTLD Registry Manager NIC-MG, the national research and education network (NREN) iRENALA, GOTICOM, Operators amongst other stakeholders, came together to hold two activities. 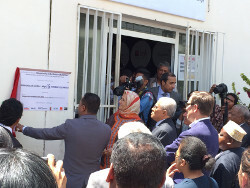 First, the morning session was reserved for the formal launch of the Madagascar Global Internet eXchange (MGIX), the Internet Exchange Point. The second session held in the afternoon was the inaugural national Internet Governance Forum (IGF). The realization of MGIX was a culmination of many years of work with the support of many organisations. According to the chairman of MGIX Mr. Haja Ramboasalama, initial attempts to establish an IXP in 2009 did not bear fruit. The second outreach was courtesy of the African Union’s AXIS project implemented by the Internet Society. The AXIS project conducted 2 capacity building workshops in Madagascar. 2 day Best Practices workshop in April 2014 and 5 day Technical Aspects workshops in August of the same year. It still took almost 2 years since the first AXIS workshop was held to realize MGIX. Speaking during the event, the MGIX chair recognised the contributions of PCH in providing the necessary technical assistance towards the setup of the IXP. As of 17th March, there were 6 networks connected to the MGIX namely Airtel, Blueline/Gulfsat, Orange, Telma and PCH DNS and research services. In addition, with the support of the University of Maryland, MGIX went live with a local “anycast” instance of the D-Root Root server, which reduced the DNS resolution latencies from over 200ms to less than 10ms. Other operators such .MG ccTLD Registry NIC-MG and the national research and education network (NREN) iRENALA are expected to connect soon. The MGIX was officially launched in a colorful ceremony officiated by Mr. Neipatraiky A. Rakotomamonjy, Minister of Posts, Telecommunications and New Technology, and H.E Dr. Elham Ibrahim, Commissioner for Infrastructure and Energy, African Union. From the format of the day, it was clear that the local community is well aware that the launch of MGIX is just but the beginning. Thus, the afternoon session was dedicated to discuss Internet Governance and the creation of the national IGF to support their national Internet development agenda. The organisers had taken advantage in the importance of the “Journée de l’Internet” to invite all their partners namely AFRINIC, AFNIC, ICANN, PCH, Internet Society, including their Island country neighbors with a delegation from Comoros and Mauritius in attendance. The invited speakers provided background information and updates on some of the topics that are at the center of discussions with respect to Internet Governance such as, the IANA transition, Collaborative Security, Access, local content, Data Centers, IPv6 and Policy amongst others. The questions and comments received from the audience were a clear indication that the dialogue needs to continue, and the IGF would be the ideal vehicle to provide that platform. It was reassuring when Mr. Jean Andriamaro RAKOTOMALALA, Chairman of the Board of Directors of ARTEC, who gave closing remarks on behalf of the Minister, reassured the community of the Governments support for future IGF events. *This article has been adapted for NUANCE. It first appeared on the Internet’s Society website. Read the original version.